To fulfill our commitment of producing farm fresh 100% Canadian goat dairy products Happy Days Dairies maintains 3 processing plants and has 12 dairy farmers under contract in British Columbia and Alberta. We are Western Canada's Goat Dairy. All 3 processing plants are located nearby our family farms ensuring all fresh goat milk is processed immediately. Plant locations include: Salmon Arm, BC (processing and Head office), Chilliwack, BC (processing and retail store), and Ponoka, AB, (custom processing). Processing milk at our Chilliwack plant. Happy Days takes pride in keeping our operations local in the communities we serve ensuring the freshest and highest quality goat milk products make it to market. Our operations are set up with sustainability in mind, we minimize the distance our products need to travel to reach the store shelf, helping reduce our carbon footprint and impact on the environment. 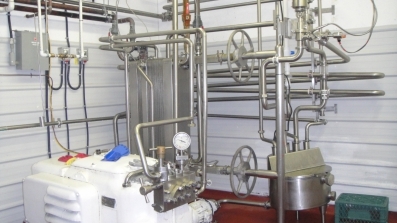 Happy Days processes all goat milk dairy products with the utmost professionalism, care and knowledge. 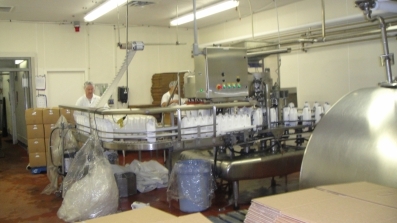 Each plant must pass rigorous inspections by the Canadian Food Inspection Agency (CIFA). Happy Days is also approved by the United States Food and Drug Administration (FDA). Goat milk, like all milk, is very sensitive, and careful processing practices are extremely important to maintain product quality controls. 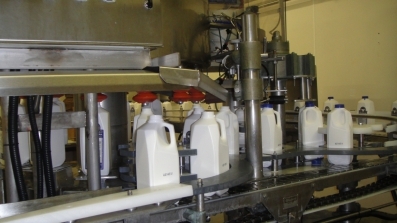 Happy Days fluid milk production line at the Chilliwack Processing plant. 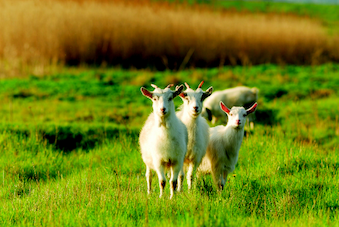 All of Happy Days goat milk products are guaranteed free of antibiotics and growth hormones. All batches go through multiple testing to ensure purity. There are no additives. Chilliwack processing plant, pasteurization tank. Our committed and motivated dairy farmers take very good care of their animals to produce the highest quality goat milk every day. Our goats are humanely treated and have access to clean fresh air and water. All our goats live in open air barns with access to the outdoors at their leisure, weather permitting as they don't like to venture out when its cold or too hot. The barns are clean and the goats are all together in large open areas with hay bedding. The goats diet is nutritious year-round diet of natural non gmo alfalfa hay ( up to 96 % of total diet), free pasture as much as the goats take in, and a grain ration that includes a protein, mineral and gut health source. They are happy goats and you can really taste the difference in our products! The consistent care and routine of our herds ensures consitency in the taste of the milk. Most folks who try our goat milk for the first time are extremely surprised how good it tastes. There is no "goaty taste" with our goat milk. Only a clean, smooth, bright and very delicious taste. 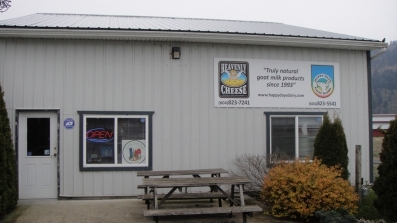 If you are traveling from Vancouver eastbound, stop in at our “Heavenly Cheese” store in Chilliwack. We are open from 12 to 5 Wed. to Sat. Our motto “try before you buy” will give you the opportunity for some tastings. The store address is 7350A Barrow Rd, located on Yale Rd between the Yale Rd west exit and the Lickmann Rd exit parallel to Hwy#. Come on in for some Heavenly Cheese!